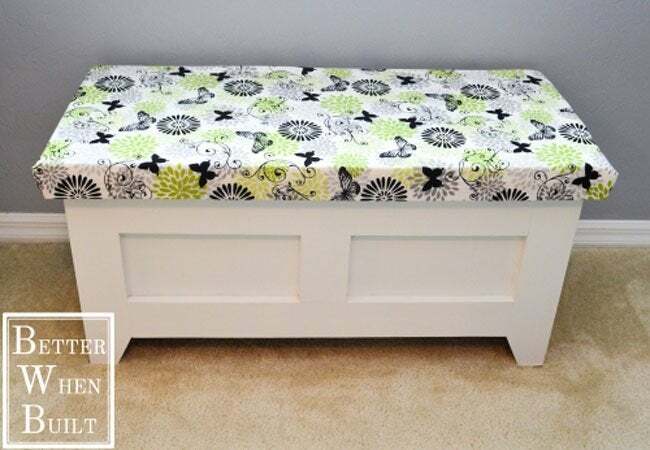 Stylishly cure a lifetime of clutter by building one of these easy and inexpensive storage benches. When you’re choosing functional furniture for your indoor or outdoor spaces, an ideal piece would feature three characteristics: comfort, style, and storage. Whether placed in a small entryway or on a back patio, a storage bench meets all these requirements, increasing seating, doubling organization opportunities, and adding a boost of pattern or style to any room. While some store-bought models don’t come cheap, you can still incorporate this multipurpose marvel into your home with a few materials and some ingenuity. 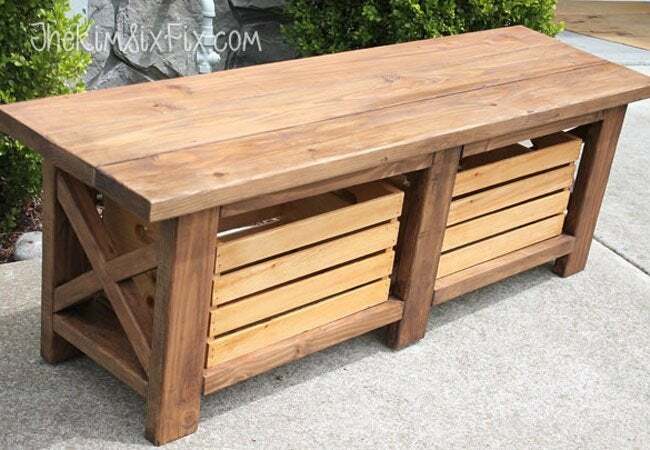 Run through these five DIY storage benches for ideas and inspiration to help you build a version of your own this weekend. 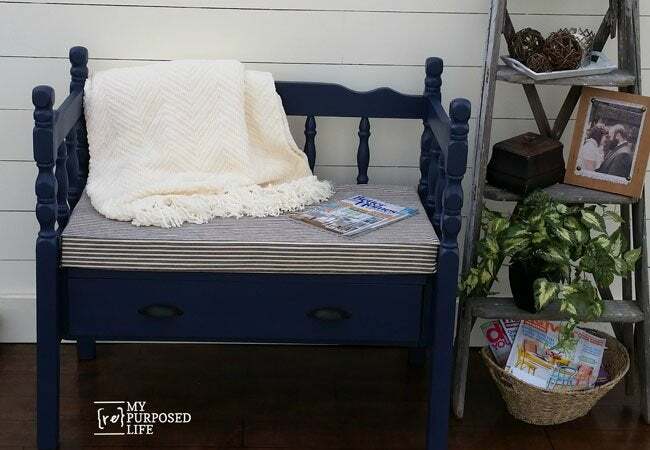 This dreamy storage bench from My Repurposed Life cleverly relocates the comforts and style of basic bedroom furniture to the great outdoors. The mastermind behind this innovative idea began by cutting the footboard of a bed into multiple pieces to fashion the frame and armrests. A $5 scrap drawer is the true hero of the piece, serving as both the seat and subtle storage for outdoor oddities. The no-sew cushion adds a cozy finishing touch, making this bench an ideal spot for porch lounging on fair-weather days. 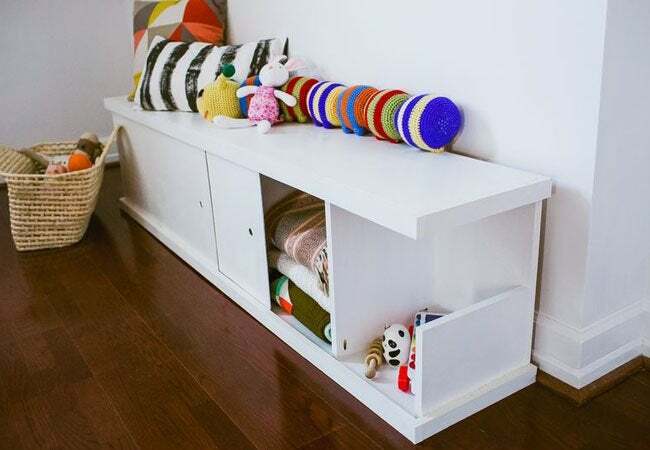 Sleek and hardworking, this storage bench was designed with kids in mind. Cunning half walls at either end mean that kids can stash toys behind closed doors without even having to slide them open. 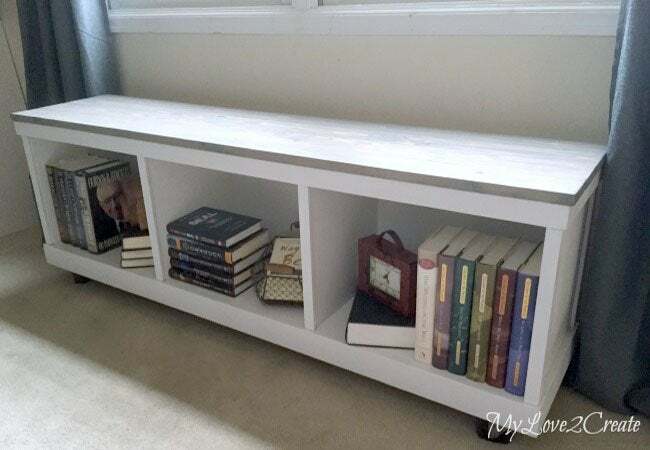 A resourceful DIYer from A Beautiful Mess challenged himself to make the frame of this bench from a single sheet of particle board; pocket holes secure the pieces. After attaching the top, verticals, and back, he positioned the sliding doors and held them in place with surrounding strips. Finger holes in the doors make them easier to slide for access to toys and knickknacks. If needless clutter has invaded your home, don’t flip your lid—flip an inexpensive particleboard cabinet instead. This elegant storage bench from My Love 2 Create is actually a tall laminate cabinet that’s been turned on its side, trimmed with scrap wood, and outfitted with a huddle of furring strips for the bench top. The weathered-wood stain gives the piece a winsome appeal, and screw-on casters make it easy to wheel away this homegrown storage solution at a moment’s notice. If loose stationery and folders have left a paper trail throughout your house, file them away in this open-top storage bench from Better When Built. The pieces—legs, front, back, and sides—were cut from plywood and assembled using pocket-hole screws, and then the bench was sanded and painted. The success of this space-smart bench literally hinges on the bench top—an eye-catching, foam-cushioned lid that’s fastened to the frame with lustrous nickel hinges. This wooden bench is a double-duty solution for space-challenged backyards. While the standard wood design serves as the perfect perch for guests, it’s the storage area underneath that makes this build truly functional. Although Kim from The Kim Six Fix outfitted her version with thrift store crates she found for a steal, any bins you have lying around will do to house your pool toys, lawn games, or other outdoor extras that need corralling.